Klingon poetry readings get out of hand very quickly. Poetic form or Star Trek villain at McSweeney’s. Way harder than I assumed it would be. I mean, Luc Bat? I totally saw that episode! Once you take the quiz, you could write a poem in a specific poetic form about one of the Star Trek villains. This is way cooler than my high school English projects. 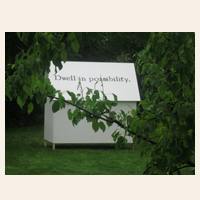 Deerfield Academy student Peter Krasznekewic has constructed 34 small houses, all made from sustainable materials and all bearing a line from an Emily Dickinson poem. His “Little White House Project” is featured on the grounds of the Emily Dickinson Museum in Amherst. So excited to hear that teens like Peter and looking for ways to both appreciate art and create their own, while also connecting to their communities. The exhibit will be up until June 30; it’s free and open to the public. Good excuse to make the trip out to Amherst! Read the rest of the article for more info on Peter and his project. April may be cruel, but it’s also National Poetry Month. Over at the National Children’s Book and Literacy Alliance, they share some suggestions and resources for helping young readers learn about and love poetry. My favorite tip: “Put poetry in an unexpected place…perhaps the bathroom mirror?” I think it’s easy to resist poetry it’s held up as somehow sacred and, as a result, it becomes an “other.” Poetry can be part of our everyday lives, while you brush your teeth or make breakfast. In the spirit of sharing poetry, here’s one of my favorite poems: Monet Refuses the Operation by Lisel Mueller. The ending gives me chills. Feel free to share your favorite poems in the comments!